One of the booming business today is an apartment where you can get the capitals you have invested for just few years. In residential Lease Templates it can formulate your own official document that will serve as your partnership with the occupants. It is manageable in sample format where all of the settings and options of the template can be appreciated well. All of the things you will see in the file will help you to regulate the terms and conditions of the apartment that will be rented to be able to have a serene place to live with other occupants and generate the income you wanted. You can also see Lease Invoice Templates. Whenever a landlord wants to lease his/her apartments he is required to make an agreement with the tenant to avoid quarrels that may arise in the future. This template is prepared by a professional writers who are experienced in the field. The template is fully customizable and comes in various file format including the popular Microsoft Word. 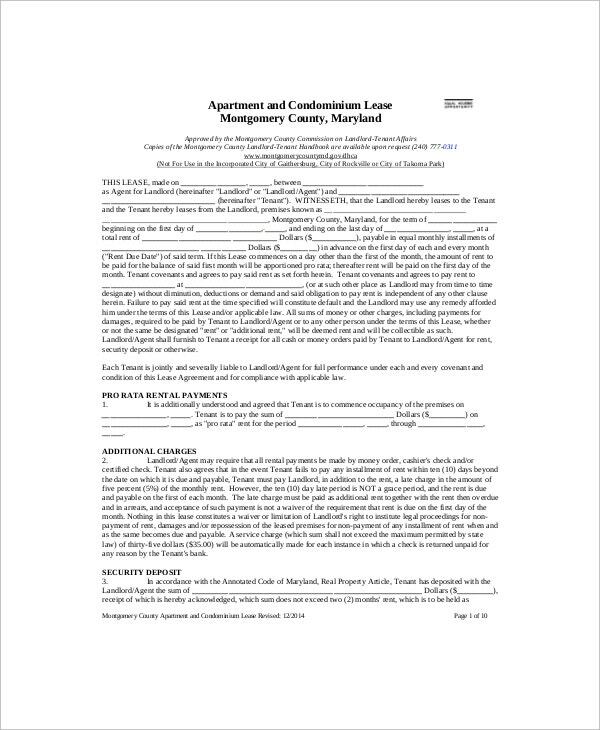 This is an apartment lease form that the tenant is required to fill they are details and state that they are agree all the terms of conditions that the landlord has set. Sometimes it’s hard for the landlord to prepare the form by themselves and at the template is prepared to assist them in preparing one. 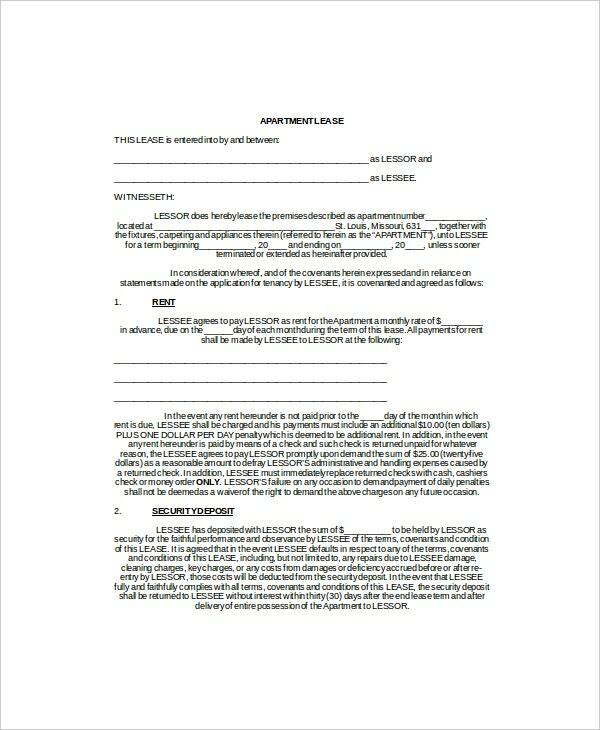 This is a sample of an agreement made when leasing an apartment. The sample is used to guide the landlord on how to write the apartment lease letter include the style, tone and the structure. The template is sample lease letter is fully customizable and can be downloaded in various file formats including pdf and Microsoft Word. This is a template drawn up and made ready for download in various file formats for users who want to rent or lease a residence to have a guide while making an agreement to avoid leaving out important details. The template can be fully customized using different word processing software and pdf. A lease is a contractual agreement between the landlord and the tenant. The lease is mostly used on vehicles and apartments. The document contains the terms and conditions the lessor have agreed with the lesser. The terms include the beginning of the contract and the end the rent to be paid for the period and the conditions which are to be followed. 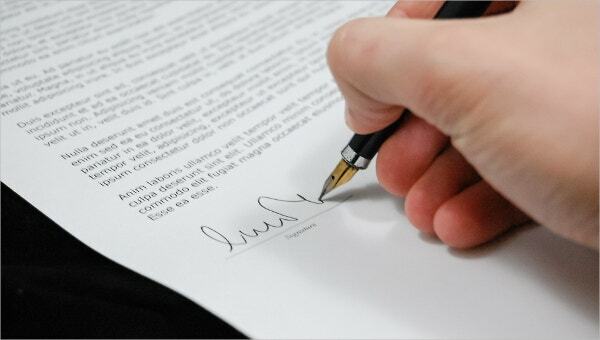 The document helps to avoid indifference between the two parties during the period of their contract. You can also see Lease Termination Letter Templates. > Why is an Apartment Lease Required? An apartment lease is required whenever the landlord don’t know how to draft one or they are not sure of all the important key elements that should be included in the lease. A leaser can also require a lease template just to be certain of the elements that should that they should expect in a lease letter. 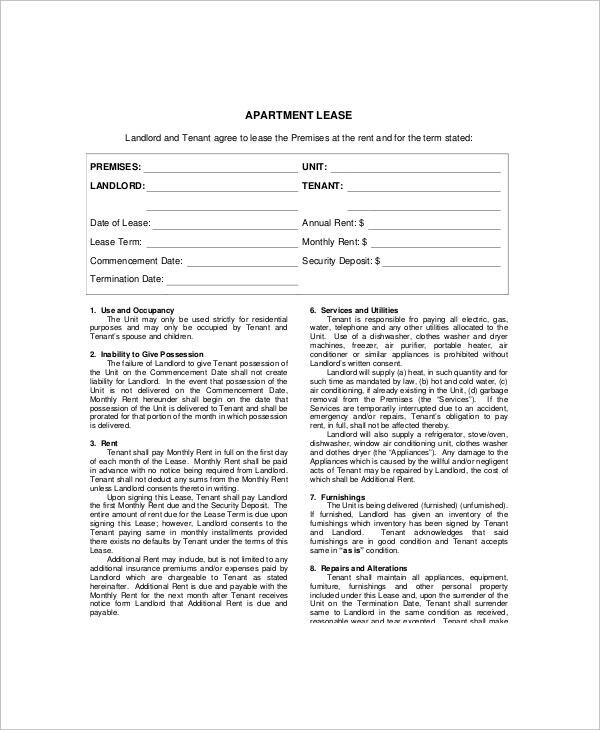 The names of the tenant: this is an important detail that shouldn’t be left out whenever writing an apartment lease, another important thing that should appear on the apartment lease letter is the limit of the occupancy, this shows when the contract is beginning and when it will end. Rent is another important aspect that shouldn’t be left behind whenever writing such document. You can also see Rental Lease Agreements. We have a vast of templates available for free download on our site, these template are in various formats and can be easily customized using different word processing software. The templates are prepared by skilled writers to ensure that they are efficient and effective.